WHAT THE PROS KNOW ABOUT WHO’S DEPRESSED. October 30, 2015 October 30, 2015 Kathe Skinner, M.A., L.M.F.T. This is a Trick (or treat) question: The answer is either, neither, or both pumpkins. One could be minimizing, the other might be overreacting. The right answer is that more information is needed. Are you ever concerned that someone you know, or care about, is depressed? Maybe you’re even worried about yourself. What are the signs that people who judge those things — like therapists or doctors — look for? Most importantly, what should you look for, and what can you do about it, anyway? Lack of motivation is more than daydreaming or putting off housework once in a while. Lack of motivation due to mood disturbance is all-encompassing and includes not wanting to do things you usually like to do or not finding pleasure in doing them. Sleep disturbance isn’t just the once-in-awhile variety of insomnia nor is it the weekend catch-up sleep most of us seem to need. While we all worry and sometimes we can’t sleep because of it that’s no reason to believe you’re depressed. By the same token, you may oversleeping because you need rest. Sleep disturbance due to depression is not refreshing, not productive and happens more times than not during a distressful period. Poor concentration describes difficulty keeping your mind on a task, especially when the task is something that needs attention paid. This includes work, reading, watching television, a hobby, or talking with someone. Poor appetite or overeating is remarkable if the behavior is outside the norm. No doubt that, from time to time, we’ve all indulged (too much) in a favorite food; teenage boys are notorious for being bottomless pits. Reasons for not wanting to eat range from having a stomach bug to not liking what’s for dinner to being fussy. If an eating disorder is present, though, that’s cause for concern because of its link to depression. Feeling down, depressed or hopeless has no up-side; always pay attention. Feelings such as these are not transient, in-the-moment feelings; hopelessness is in no way comparable to disappointment. Never ignore thoughts or verbalization that it would be better to be dead. Talk to a counselor, doctor, or clergy as soon as possible. Don’t second-guess yourself If a plan is in place, and the means to act on suicidal impulses are handy — get to the emergency room right away! Perspective gets lost when people force a permanent solution onto what may be a temporary problem. Getting the right help can literally be a lifesaver. If you’re concerned about suicide, ask. It’s a misconception that asking “plants a seed”. Depression is a signal that something’s not right. Is it brain chemistry? Relationship or work problems? Something personal? The biopsychosocial model says that all spheres of who we are — the biological, psychological, and social — all “communicate” with each other. Like all things that get out of whack, whackiness comes in degrees. Problem-solving the degree gives you information about what to do. Is there significant distress or impairment? Who notices? And what’s noticed? Could it be something else, like substance abuse, medication, or a medical disorder? Sometimes the only intervention needed is someone to listen; an interested and uninvolved second party can give the much- needed perspective someone needs to get out of a funk. If you feel like you’re in over your head, you probably are. In fact, even professionals call on other professionals when they feel stymied. There’s no shame in helping someone identify resources that don’t include you. 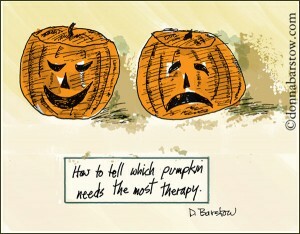 The pumpkin illustrates there’s not just one face to depression. It’s complex and sometimes not easily spotted. The best we can do is to be non-judgmental, kind, and available to listen to someone who’s having a hard time, depressed or not. In case of a mental health emergency, call 911 or go to the nearest hospital emergency room. Kathe Skinner is a psychotherapist in private practice who works primarily with couples, individually and together. She supports several mental health initiatives, including Project Semicolon, whose message is that your story is not yet over — and encourages obtaining a semicolon tattoo. She lives in Colorado with husband David and their two hooligan cats. Find out more about Kathe @ www.coupleswhotalk.com or www.beingheardnow.com.